As I have said before, I often find the hardest part of writing a report such as this, or indeed any other similar piece, is how to get started. 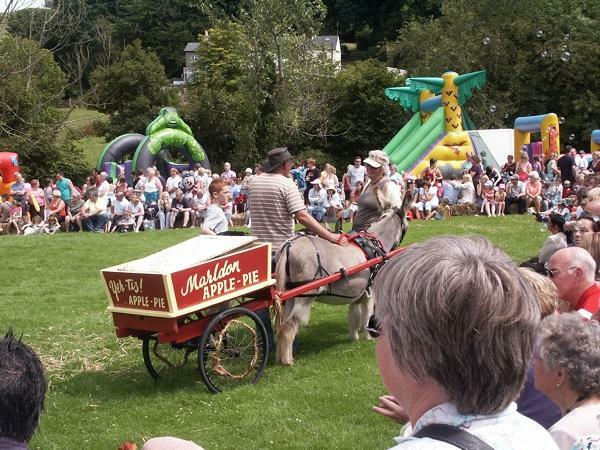 However, as this is the glorious month of July, and this is Marldon, I have a ready made “opener” – MARLDON APPLE PIE FAIR – Marldon’s claim to fame, and probably the most important day in the Village calendar, and long may it remain so. I am sure that in the Parish Magazine there will be a piece (as there was last month) from the Organising Committee giving all the details of what’s on and what you can see and do to support our big event. As you probably know, all profits from the Fair go to the Village Hall Council for the maintenance and improvement of our excellent Village Hall. PLEASE give your support on the day, and help to achieve a record attendance. Hopefully the glorious weather will stay with us until the end of the month, or at least until the 28th JULY! The History Group will have a small stand in the Main Hall, with a display of old and recent photos, and we hope you will come and see us. Refreshments will be available in the Hall all afternoon, and hopefully you will want to come in out of the sun!! I must mention our last Open Meeting at the beginning of last month, as our talk was especially interesting due to its subject and was much commented on (favourably, of course) by our audience afterwards. The subject was “War Horse” and our speaker Paul Rendell entertained and informed us not only about the recent film, but also about many other films made on location on Dartmoor going back very many years. With regard to “War Horse”, we heard that much filming was done at various locations on the Moor, and the methods (and time and money) which were spent to achieve authenticity. Paul was also able to show us many “unofficial” photographs he had taken of the locations and special effects used, and also of Producer/Director Steven Spielberg himself. All in all, a very entertaining and informative evening, and we were pleased to see several non-members in our audience. Our next Open Meeting will be on Friday 7th September, and is also our AGM when you can renew your membership for another year for just £5.00 per person. Our Guest Speaker, Simon Dell, is new to us, and we have been unable to book him for some time due to his being much in demand. His talk will be “Policing the Peninsula” and is a history of policing in the West Country, with some amusing anecdotes. There will be more details of this in next month’s Magazine. Don’t forget – see you at the Apple Pie Fair – SATURDAY 28th JULY. Good day Doreen – Thank you for your lovely comment .. you certainly have some happy memories of Marldon Village and I am so glad you follow us now via our website now. Very best wishes to you too. Hi Doreen – found out last night that we live next door but one to where Beryl & Derek lived in Millmans Road! I cannot remember Derek but we knew Beryl quite well, having lived here for 15 years now. We are very good friends with the couple who live there today, Clive & Jenny Mather.. I am writing to add to the comments made by our Secretary Derek, and to thank you also for your interest in our Group and for your good wishes. The Apple Pie Fair was held a few days ago (Saturday 28th July) and although the Committee has yet to finalise the figures it looks as though this years Fair will be one of the most successful, due partly to the glorious weather we are having here. As you may know, all proceeds from the Fair go to the maintenance and improvement of our Village Hall. My wife and I also knew Beryl well (or Mrs Ryan as we always referred to her, due to her being one of the dinner-ladies team at the School, this being of the time when the children’s lunches were prepared at the School.